New York City Public Advocate Bill de Blasio is poised to become the city's next mayor, and he may have his kids to thank for it. With the most recent Quinnipiac poll showing de Blasio dominating his Republican competitor Joseph Lhota, 65 percent to 26 percent, the Democrat is expected to easily win Tuesday's race. Yet back in July, de Blasio was trailing in the Democratic primary behind City Council Speaker Christine Quinn, even after poaching supporters from scandal-plagued Anthony Weiner. Then in early August, de Blasio launched a campaign-defining ad starring his teenage son Dante. Sporting a large afro, the young African-American praises de Blasio's positions on issues like affordable housing and New York's controversial stop-and-frisk policy. Only at the end of the ad does he acknowledge that the Italian-American Democrat is his father. "Bill de Blasio will be a mayor for every New Yorker, no matter where they live or what they look like," he says. "And I'd say that even if he weren't my dad." By mid-August, de Blasio was in the lead in the Democratic primary. While de Blasio's candidacy was already on the rise, political observers say the "Dante" ad marked a turning point for his campaign. 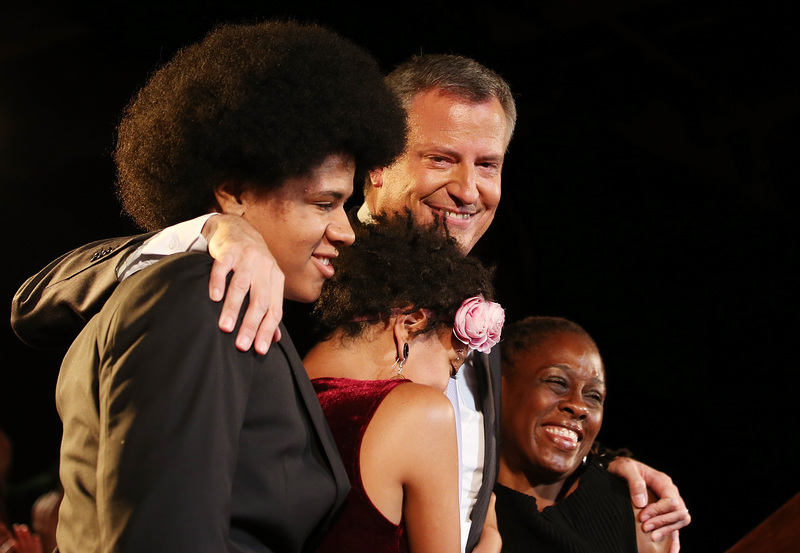 De Blasio's decision to make his two children, Dante and his 18-year-old daughter Chiara, a prominent part of his campaign was a political risk that paid off. The "Dante" ad "created a certain emotion, a definitive emotional connection between de Blasio and the voters that propelled him from fourth to first place in weeks," New York-based Democratic consultant Hank Sheinkopf told CBSNews.com. De Blasio's children helped voters relate to the candidate on a number of levels, Sheinkopf said. For one thing, he said, "the diversity in his family... made him more believable as someone who could talk about income disparities in New York." With around 170 languages spoken in the borough of Queens alone, diversity counts. In one video the de Blasio campaign promoted online, Chiara introduces her father to a crowd, remarking that he isn't "some boring white guy who just didn't know what he was talking about." Specifically having his African-American son broach the issue of stop-and-frisk was also effective. The Aug. 13 Quinnipiac poll, which showed de Blasio leading the other Democratic candidates, revealed that 60 percent of likely Democratic voters were critical of stop-and-frisk -- and among those who were critical of the policy, the plurality supported de Blasio. In that poll, de Blasio also won the highest marks among the Democrats for having a "strong personal moral character" -- a total of 63 percent of Democrats said the phrase described de Blasio "a great deal" or "a good amount." Showcasing the de Blasio children cast the campaign as a "family effort," Sheinkopf said. "De Blasio and his wife came across as extraordinarily good parents, which blunted other attacks -- i.e., a person who is that good of a father can't be a bad guy," Sheinkopf said. While many high-profile children of politicians have famously been shielded from the spotlight (see: Chelsea Clinton, Barbara and Jenna Bush, and Malia and Sasha Obama), it's not unheard of for children to play a role in political campaigns, but it's not something that can be forced. The de Blasio kids took an active interest in their father's campaign, and Dante on multiple occasions threw out the professional talking points he was handed and spoke from the heart, according to John del Cecato, the political strategist who created the "Dante" ad. "Kids that age are incapable of insincerity," del Cecato told the Daily Beast. "You could ask a 15 year old to act a certain way or to say something they didn't mean, but you are not going to get a response you like because they won't do it. I think part of it was that he didn't need direction, that he wouldn't take direction and was going to say it the way he wanted. He is at the age where BS is not an option." De Blasio's opponent Lhota has a 22-year-old daughter, Kathryn Lhota, who has opted to help her father without putting herself in the spotlight. "Being out and meeting people and hearing about the city they want to have over the next eight years, that's where I'm comfortable. I like listening," she told the Wall Street Journal. Lhota late last month accused de Blasio of using his children as a distraction, remarking, "This is a campaign about the future of New York, not about your children. It is about everybody else's children." Still, the prominence of the de Blasio children in the campaign has left Lhota in an awkward position. "You have to be very careful not to appear to be attacking the family," Sheinkopf said.